Lucas Museum of Narrative Art is a museum planned to be built in Chicago. Image: courtesy of MAD Architects. Envisioned as a centre of education, culture and inspiration, the museum’s design imitates the harbour and other surrounding areas. Image: courtesy of MAD Architects. A bridge, connecting the museum to Northerly Island, will also be built as part of the project. Image: courtesy of MAD Architects. To be constructed on a 17 acre site, the museum will have a unique collection of narrative art forms and popular art from illustrations and comics. Image: courtesy of MAD Architects. Some of Chicago’s most celebrated institutions such as Field Museum, Shedd Aquarium and Adler Planetarium will be near to the new building. Image: courtesy of MAD Architects. 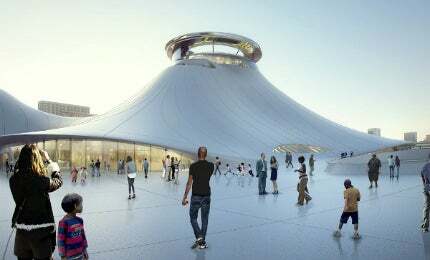 Lucas Museum of Narrative Art is an art museum planned to be built in Chicago. To be constructed on a 17 acre (6.8ha) site, the museum will have a unique collection of narrative art forms and popular art from illustrations and comics. Plans for the state-of-the-art museum were announced in 2014 by Star Wars filmmaker George Lucas. Chicago was chosen as the location due to its vibrant and rich cultural outlook. Hailed as a cultural institution, the Lucas Museum of Narrative Arts will offer visitors a look into the visual evolution of the 20th century through illustrations, cinema and the innovation of digital medium. MAD Architects, based in Beijing, have been selected to design the museum building on Chicago’s famous Museum Campus at the lakefront. Construction is estimated to cost between $300m and $400m with the entire cost being absorbed by George Lucas. No funding will be provided by the Park District or the city of Chicago. It is expected to be completed by 2018. "The Lucas Museum of Narrative Arts will offer visitors a look into the visual evolution of the 20th century through illustrations, cinema and the innovation of digital medium." The museum is set to occupy 400,000ft² between East Waldren Drive on the north and the McCormick Place Lakeside Center on the south and will additionally include a 285,000ft² parking structure. Proximity to public transportation, easy accessibility and space to create a green cover are some of the factors that backed the Chicago lakefront region as the favoured choice for developing the building. Some of Chicago’s most celebrated institutions such as the Field Museum, Shedd Aquarium and Adler Planetarium will be neighbours to the new building. The site currently serves as a parking space that will be moved underground after construction of the museum building. Inspiration for the design was drawn from works of Frank Lloyd Wright and Mies van der Rohe, to create a monumental structure that effortlessly merges the allure of the park and Lake Michigan with the prominent architecture of Chicago. Envisioned as a centre of education, culture and inspiration, the museum’s design is futuristic with a floating disc-like structure that imitates the harbour and other surrounding areas. It features a conical structure with a flowing and curved design. The museum is designed to be built of a single material, stone, to emphasise the timelessness of its design. A bridge will also be built connecting the museum to the nearby Northerly Island. Scheduled for completion by the end of 2015, the project will provide a new entry experience and a sculpture garden. The tallest points of the museum will offer panoramic views of Chicago and Lake Michigan from an observation deck. The museum will be designed to have three levels of exhibition space resembling infinite loops. A raised plaza will provide a gathering place for people along with views of the harbour. Open spaces will be developed to allow picnicking, biking and recreation grounds for public access. The museum is designed to have approximately 20,000ft² of dedicated green space. The landscape will comprise historic topography and native vegetation of the lakeshore. To add to the beauty of the campus, the asphalt parking space will be replaced with green park areas. The new park areas will be separated into distinct zones. A series of moors formed by water are also planned to create an eco-park to filter storm water. A dunefield formed by the wind has been designed to provide secure spaces to harvest vegetation. Civil engineering, traffic engineering and surveying services for the project are being provided by TERRA, who will work in collaboration with the museum, City of Chicago and other design team members will provide hydraulics, hydrology, utilities and traffic solution. Studio Gang Architects and SCAPE Landscape Architects have been selected to provide landscape services for the project. The connecting bridge to Northerly Island will also be designed by Jeanne Gang from Studio Gang Architects. VOA Associates is the architect on record for the project, while Applied Ecological Services has been selected as the ecological consultant.